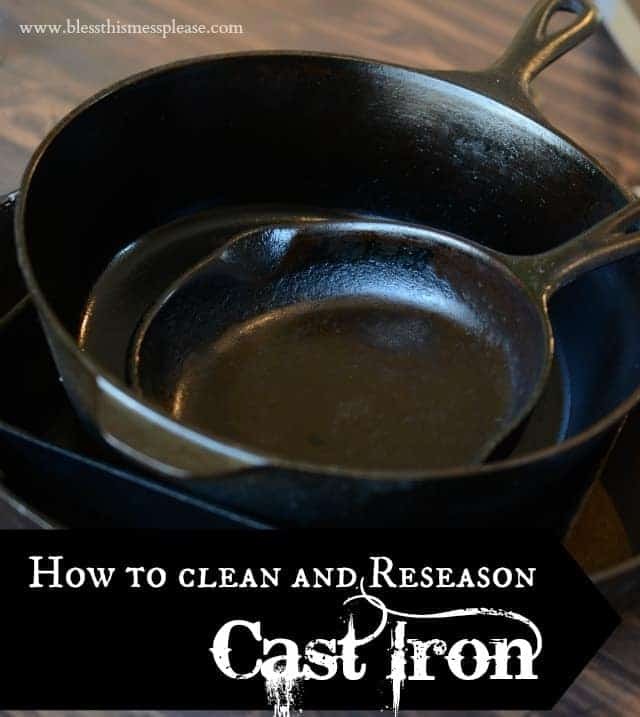 If you’ve ever wondered how to clean and season your cast iron skillet this simple tutorial has the answers to your questions! An easy, step-by-step tutorial with photos. Last month I acquired some great pieces of cast iron cookware. I traded the old yellowish-green stove that came in the house for the two larger pieces and my uncle gave me the two smaller pieces while I was in Indiana for Grandpa’s funeral (both pieces were Grandpa’s!). I own one other dutch oven that I got at a thrift store for $15 and I’ve been on the hunt for more for a few years. It was crazy that within a few weeks I had just about all the cast iron I could want (I still dream of 2 more specific pieces). 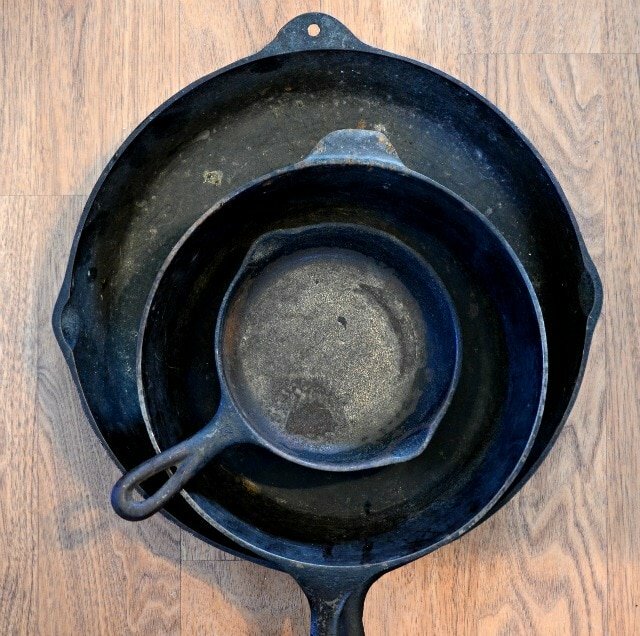 All four pieces were older and needed some maintenance, so I thought I’d share how to clean and reseason cast iron with you. First off, let’s start with my two-cents on why cast iron is something everyone should own. It is awesome! I blogged about my hate of Teflon a few years ago. The stuff is nasty and has no business being near your food. So now that you don’t want Teflon or “nonstick” pans, you don’t have a lot of options left when it comes to cooking and baking. Stoneware, stainless steel, and cast iron are some of your best choices. Cast iron is awesome because it is nonstick by nature, is very durable, and holds heat evenly and super well. It is a great option for frying foods because it keeps the oil heated evenly and consistently (if you are going to fry something, I’d make these donuts). I also love that you can start on the stove-top and move it into the oven. I like to get the cast iron skillet really hot, sear my chicken legs on all sides, and then add whatever (BBQ, lemon…) and have them finish cooking in the oven. Cast iron cookware has been around for hundreds of years and is making a big comeback! Get on the trendy wagon and get some of your own. Chances are good that you’ll buy old or used pieces, dig some out of your grandma’s shed, or find some cast iron treasure at a yard sale. 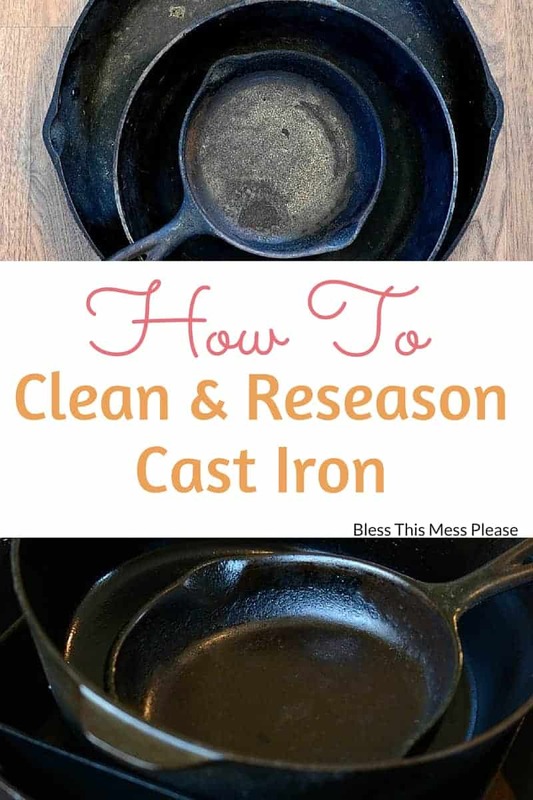 You definitely need to know how to clean and reseason cast iron before use. 2. Wash them in hot soapy water. If they are rusty or coarse use a copper or untreated steel wool pad to really scrub them. You can scrub inside and out. The goal is to remove any old oil, sticky spots, or general “crud”. Don’t fear the scrub, because reseasoning cast iron is next. Rinse very well and then dry with paper towels. 3. Evenly coat the inside and outside of the pan with vegetable oil using a paper towel. 4. Preheat your oven to 325 degrees and place the pan upside down in the hot oven. You can line the bottom of the oven with foil to catch any oil drips if you like. Let the pan bake for one hour. Expect it to be pretty smoky. 🙂 After one hour, turn off the oven and let the pan stay in the warm oven until it has cooled (that will take a few hours). 5. Your cast iron is now clean, seasoned and ready to use. You do this long procedure if you are really deep cleaning your pans. 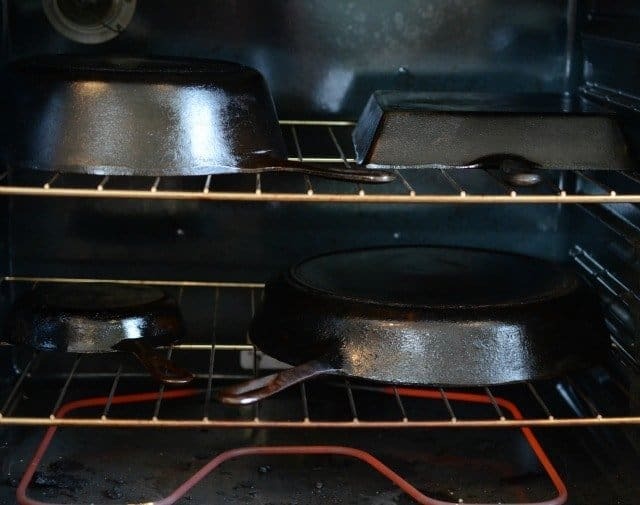 You want to do this if you are buying old pans or if you haven’t used your pan in a few years. The leftover oil in the pores goes rancid after a while and will make your food taste nasty, even if it isn’t rusty looking. If it smells bad then you should do this. 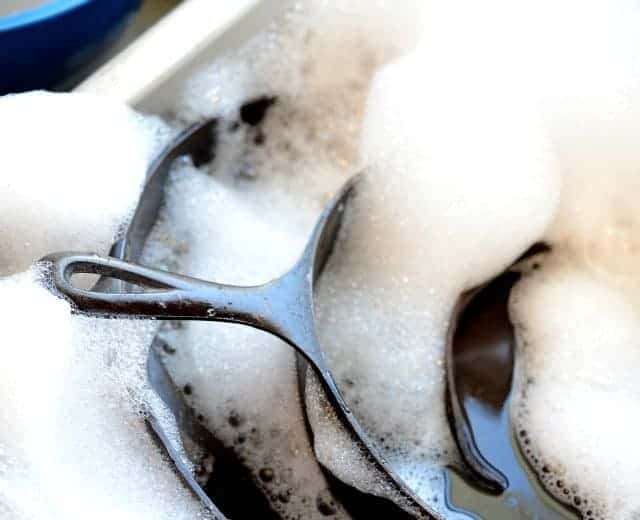 For general cleaning I like to use hot water and a scraper (I have a little plastic scraper that came with my pizza stone and I use it all of the time on my cast iron) or a copper scrubber or untreated steel wool pad. I know people will tell you to NEVER use soap on your cast iron, but I definitely do. When I have used the pan to fry or had really greasy chicken legs cooking in it, I will use a drop of dish soap to cut the grease and it works great. Just be sure to rinse well. I towel dry my pans and will rub them with a bit of oil if they are starting to look dull in color (maybe once a month/every 3 months). They are really low maintenance once you do your initial deep clean. There you have it! My love of cast iron, why Teflon is awful, and how to clean and reseason cast iron. I’m planning my future kitchen so that I can hang and showcase all of my cast iron pieces because they are just so pretty! Lucky you getting some old family cast iron pans! I really need to toss the last of my non-stick pans and go this route 🙂 Excellent resource! We season ours in the bbq grill so we don’t have to hear the smoke alarms. Your cast iron came to you in fairly good condition, I got some that was covered (and I mean covered and caked!) in rust. I used lime-a-way to get the rust off, then used steel wool, etc, like you did. Just a funny: Tim came home from school one day to a house full of smoke. He asked, “Whatcha smokin’ mom?” My reply, “Pot”. Such a good article! I love the flax seed oil concept. I hardly use veg oil and I knew there had to be a better way out there. This is a GREAT article. Thanks so much. I’m not sure how the coconut oil will do… I think it has a lower smoking point than what I recommended, but do a little research and see what it says! You will LOVE your cast iron if you get it ready and start using it! Great tips and spot on! We have also put old rusty, crusty cast iron pans in an open fire outside. We retrieved them in the morning after they had cooled, then washed, oiled and baked them. The fire really helped clean them up. I was told to never use soap on my cast iron skillet….. Your right! We never ever use soap on cast iron. It ruins the pan and th work get it back to its natural non stick surface will take much longer than a single baking session in the oven. 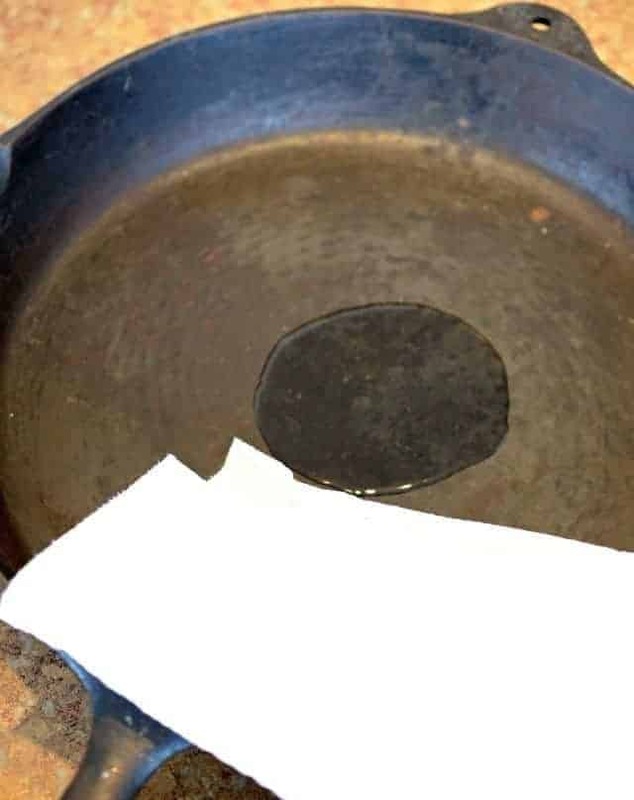 My husband restores cast iron pots and pans using a simple electrolis bathe to remove all rust and any crust then reseasons them properly by rubbing carefully with a thin layer of good oil followed by baking overnight. Our cast iron is non stick and beautiful. I must agree there the best pans for frying n I also knew about the cleaning n oiling process. Your pans look great. I LOVE cast iron. I also hope to acquire more. Mine go from stove top to oven and even put to the grill. In fact my grill and my atovetop have cast iron grates. That post is a little old, I have quite the collection now and it seems to always be growing! It’s all that I use now and love it. Thanks for the salt tip… I’m going to try that! You Missed The fact that iroN cookware kept the folks on the frontier From becoming Anemic. Iron Cookware Is healthier For that Reason. If your Iron is correctly seasoned, no soap is ever needed. 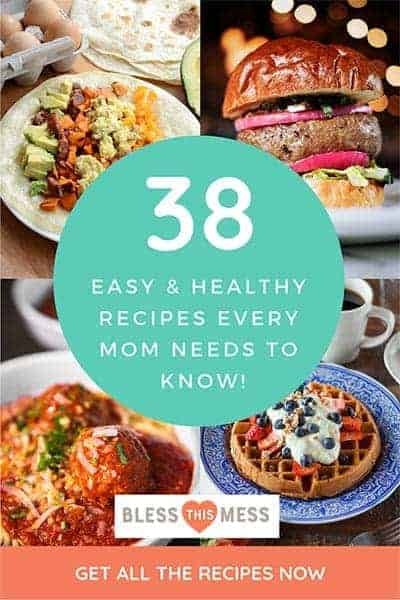 Hi – 2 quick question(s)……can I use: Grapeseed Oil? (to coat pan) & second, can I do the same treatment to my cast iron “lid” that goes with my cast iron frying pan? I absolutely loved this article! 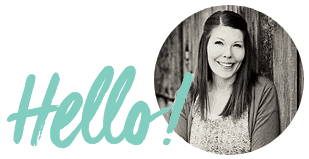 I knew there was a better way – so simple and broken down, I can’t Thank you enough! Grapeseed oil has a really high smoking point, I’m sure that you could use it, and yep, do it too the lid too! I’m so glad you have a lid, that’s so cool! I seasoned my cast iron skillet as instructed, but after it cooled it felt sticky. What did I do wrong. Yes, I love mine to! I never thought of putting them in the oven. My mama always did it on the stove top. I am going to put them in the oven tonight after supper. In also going to do it with the kids so the learn a new way of doing it! Thanks for sharing your way. Putting that sheet in…. Wasn’t labeled Teflon but it was… So be careful! Hi, I am new to cast iron cookware, but am excited to start using mine!! I just got a brand new one for my wedding (yay!) do I need to do anything before I use it for the first time?? Does it come seasoned, or do I need to do the oil process first? If you go it new I’m sure it came preseasoned, just use away! They don’t really make cast iron that needs oiled first anymore, preseasoned is the new standard. ENJOY!!! It’s something you’ll learn to love and use for years to come. I love my cast Iron and yes! I wash mine too and I also hang my on my wall. Yeah, vegetable oils just leave it sticky – no matter how many paper towels are used. Then 1 use and back to rust and lingering greasy film. Can’t find ANYONE to give me the secret of that great pan of my now deceased Mother. I have bought new ones and old ones; after EVERY use, am left with a heavy, greasy mess that, if cleaned with soapy water, leaves me with a rust bucket but not greasy. If cleaned with a wire brush and scalding hot water – still a greasy mess. Am DONE! Same as the inside, if it’s super dirty don’t be afraid of using steel wool to get all of the crud off and rebuilding the nonstick layer as indicated. Steel wool and a hot bubble bath will cure cast iron inside and out and finish with the reseasoning! 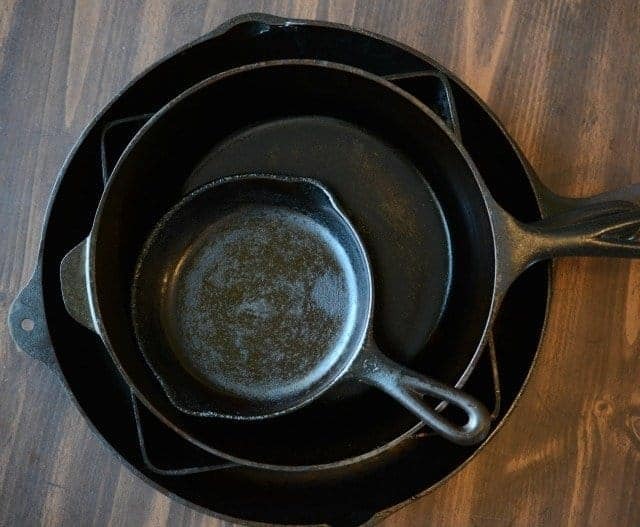 My grandmother left me a few pans and deep pans haven’t used them but they need a good cleaning when she cooked she used a coal burning stove her food always tasted great…..
What a good gift from her. I hope you use them often and think of her! Can I use my self cleaning oven to put get rusted cast iron skillet clean? I don’t want alot of smoke and what is the confusion about using soapy water to clean them? My grill isn’t working and they have been on the outside grill all summer long. I wouldn’t put it as hot as the self cleaning option on the oven, I’d just wash it and bake it like I’ve directed!